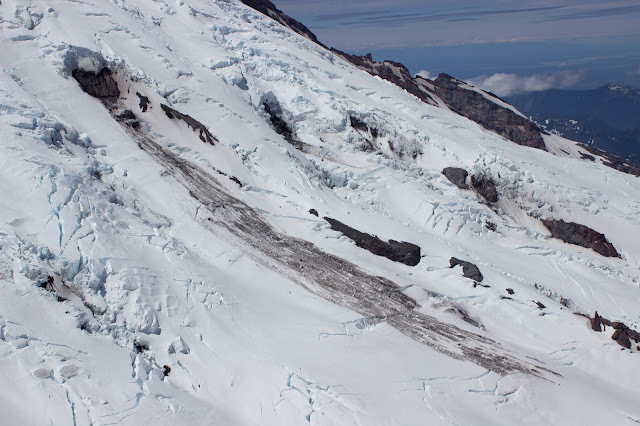 Little Tahoma is a subpeak of Tahoma that splits the Emmons and Ingraham Glaciers below the Disappointment Cleaver on Tahoma’s eastern flank. From most aspects it looks like an impossibly steep pile of volcanic choss, but its mellower eastern aspect holds the Whitman Glacier which provides excellent skiing within a few hundred feet of the summit. With weather looking marginal in the North Cascades and high on Tahoma, Matthew, Thomas, and I decided to pay the Little Tahomie a visit. 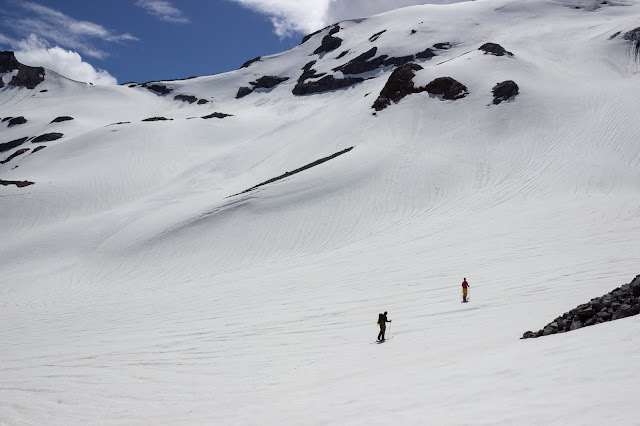 We skied from Paradise via a low route described by Amar Andalkar on TAY. 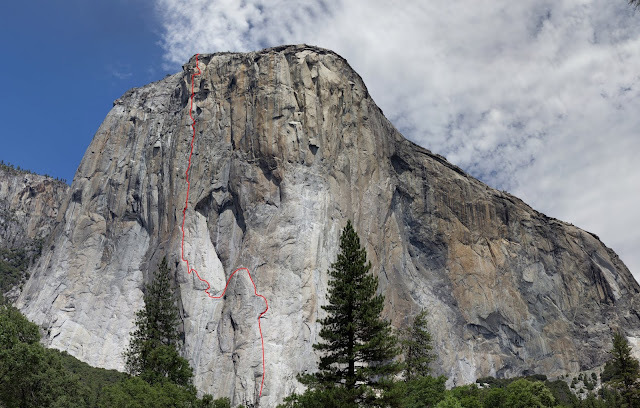 This route requires almost no hiking (unlike the Fryingpan Glacier approach) and stays on mellow glaciated terrain where a rope is unnecessary (unlike Martin Volken’s high route from Paradise). We drove out on Friday night and started from the Paradise parking lot just before 5am. 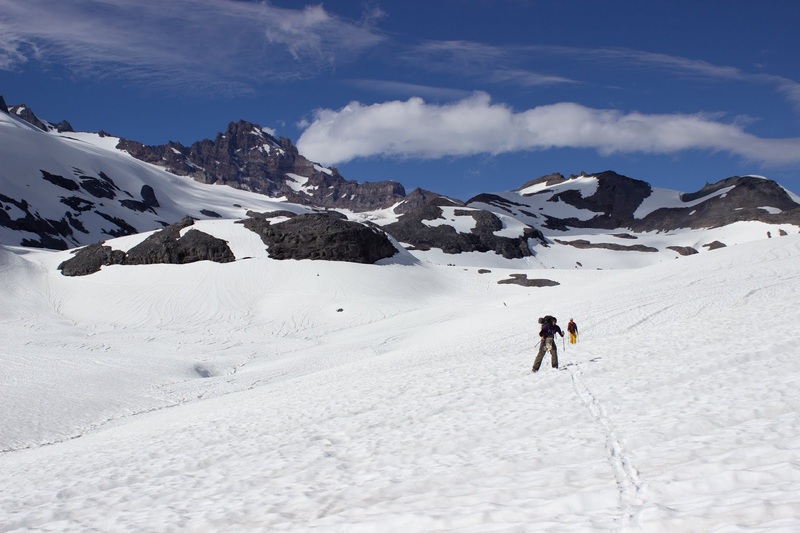 We walked down the gated Paradise Valley Road to the 4th Crossing and skinned up to Mazama Ridge on an icy crust. In hindsight, I think that skinning from Paradise to Golden Gate makes a lot more sense if the Paradise Valley Road is closed. 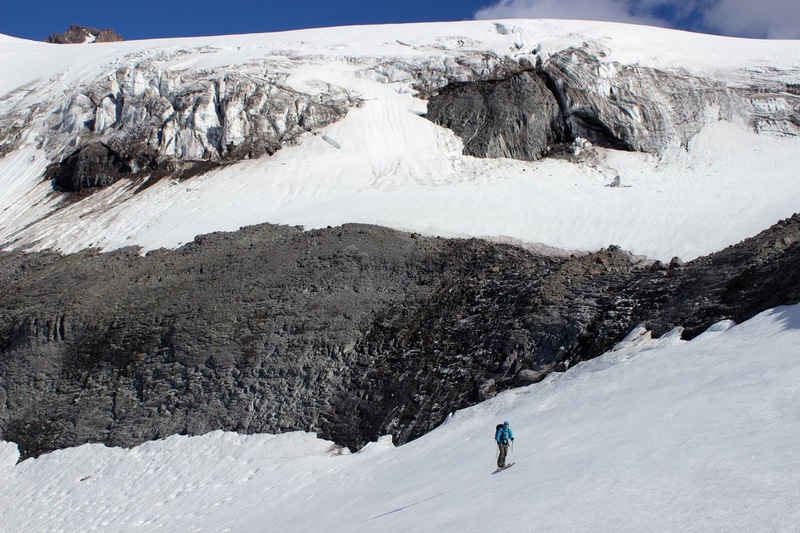 We skinned the Paradise Glacier exit to the 7,100’ col just NW of Cowlitz Rocks. 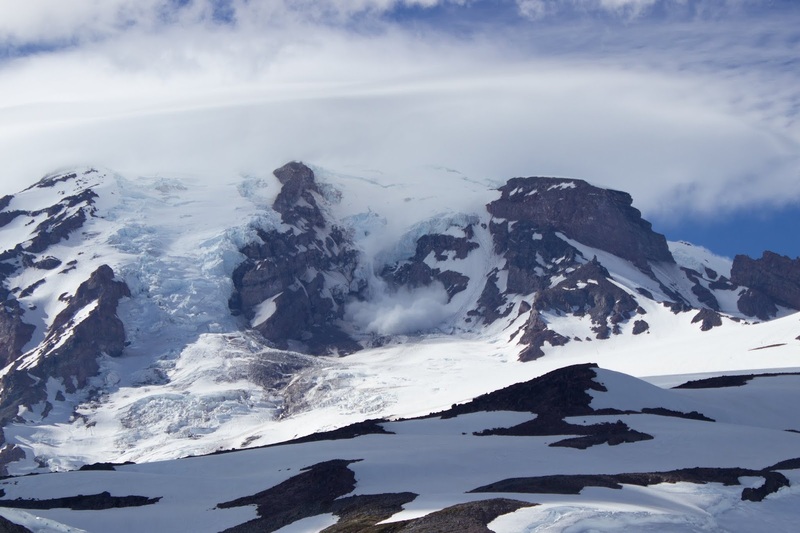 The weather was cool and overcast; clouds ripped across the summit. Snow buntings fluttered around eating ice worms before they descended back into the glacier to avoid the sun. We skied an icy descent into a massive amphitheater at the terminus of the Cowlitz and Ingraham Glaciers and traversed to the lateral moraine. We booted up a snowfinger and traversed below a heather slope into a large bowl. 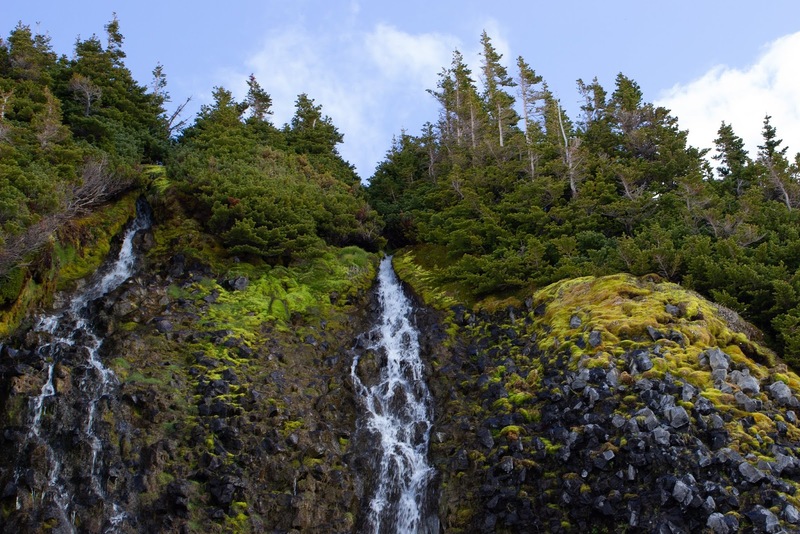 This slope is very delicate; it’s best to stay off the plants and on the rock. We continued up to a gully and then trended left. The right line appears to go as well. 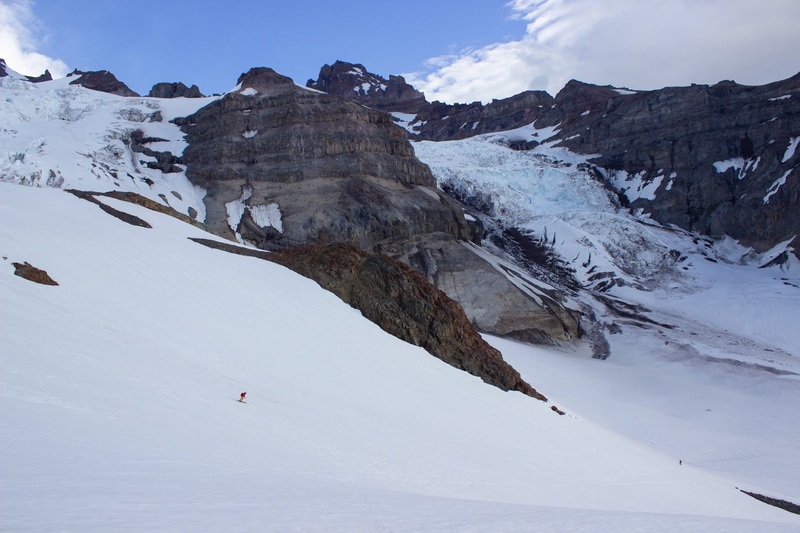 Some steep slopes brought us to a basin below a large ice cliff, and from there it was a mellow skin up to and across the Whitman Glacier. 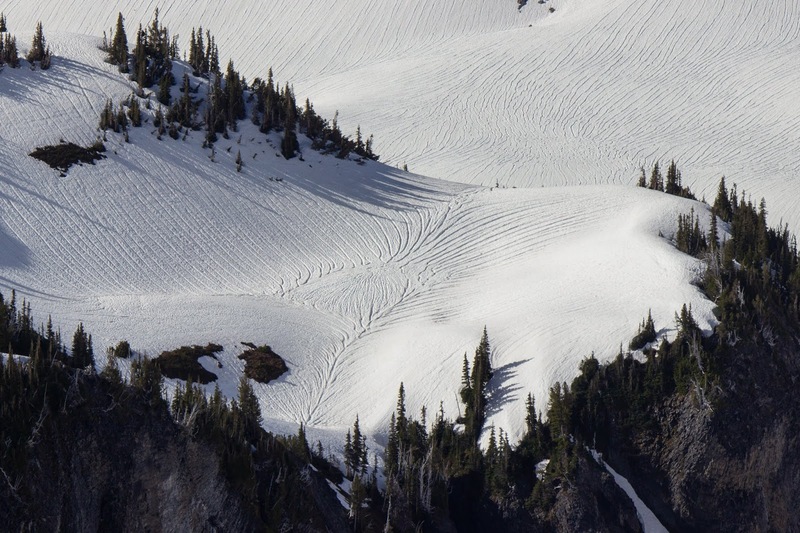 We stopped for lunch at a break in the Whitman Crest then traversed to the base of Little Tahoma's eastern headwall. At the base of the headwall a basketball-sized rock came flying off one of the cliffs above and cratered the track just ahead of us. 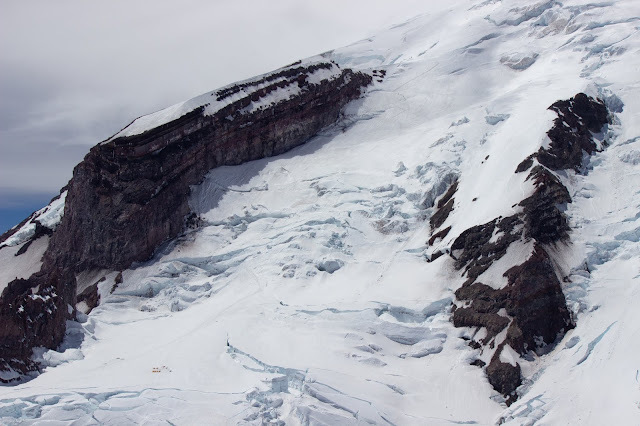 We took our skis off and rushed across the rockfall zone. 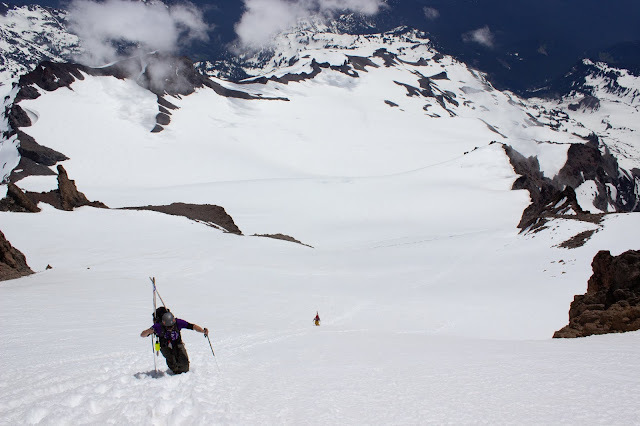 As we moved up, the snow became harder and the terrain more exposed, so we used crampons. 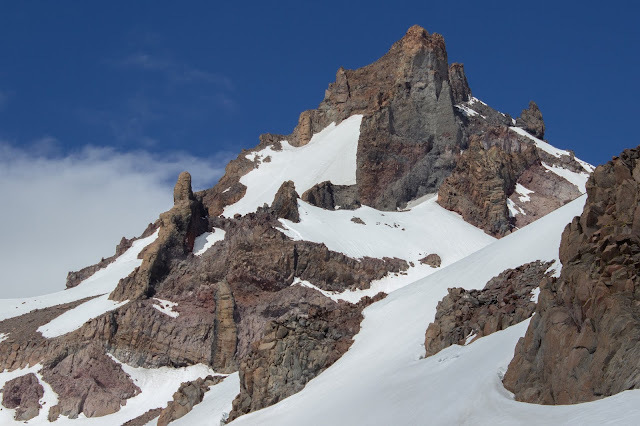 At the top of the snowfield, just a few hundred feet below the summit, we ditched our skis and climbed a short band of surprisingly solid rock. 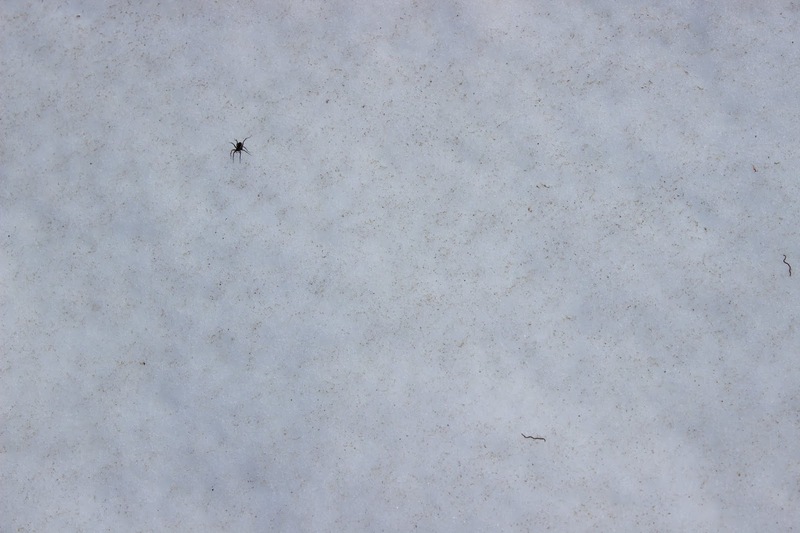 We continued up a small snowfield for a couple hundred feet. 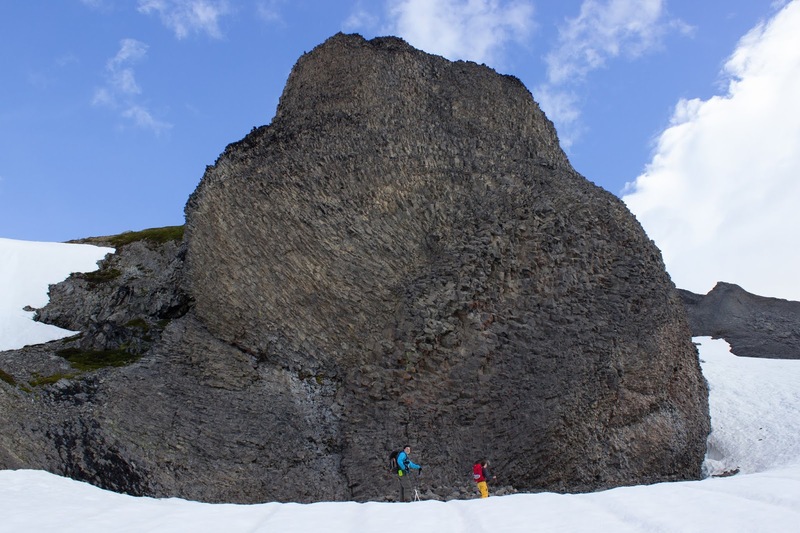 The exposure would make this an exciting ski, but having to bring skis up and down the rock band made it unappealing. Some scrambling on loose but low angle rock brought us onto the summit ridge where we got our first view off of Tahoma’s north face, which drops precipitously to the Emmons Glacier. We continued along the ridge across hollow rock to the summit. 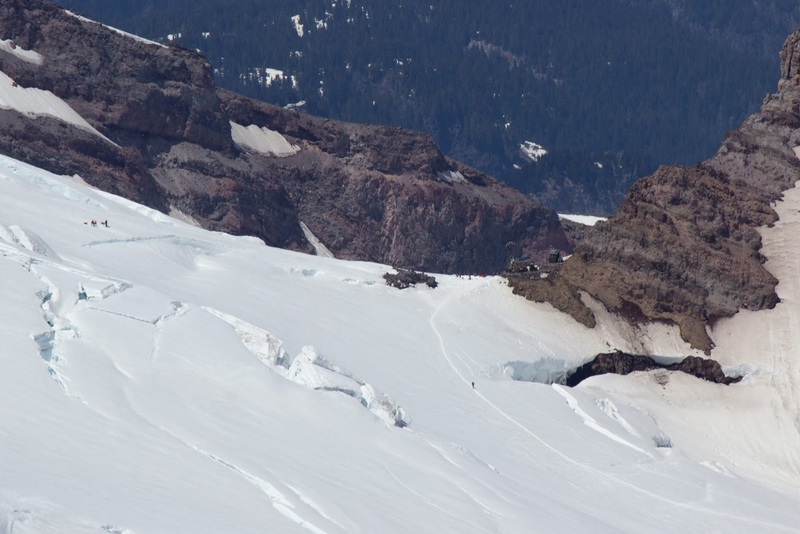 The rock on Little Tahoma was quite solid for volcanic choss except for this final bit. 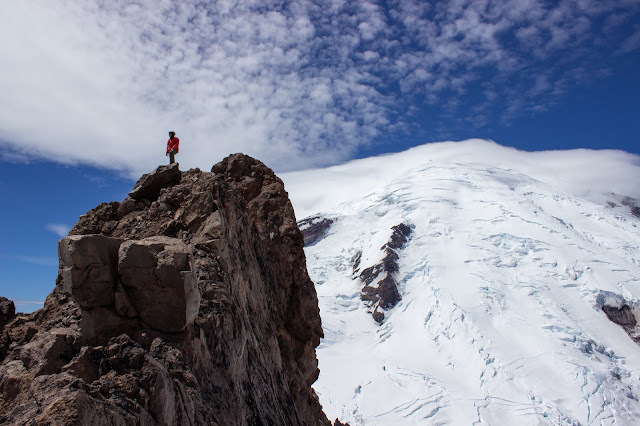 We sat around for a while, enjoying the unique view of Tahoma’s eastern side. 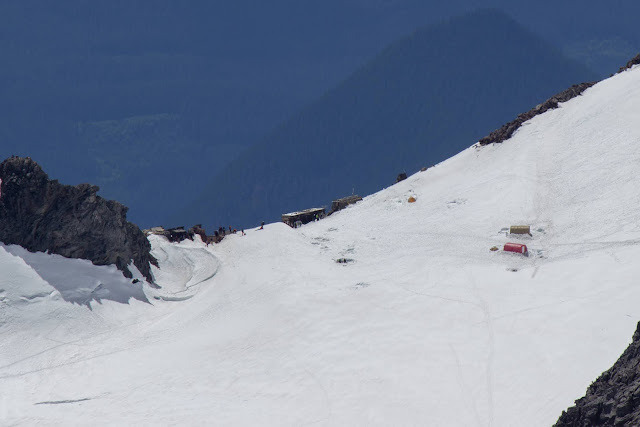 We had clear views of Camp Muir, Ingraham Flats, and Camp Schurman. There were a surprising number of climbers going for the summit given the low visibility and high winds on the upper mountain. 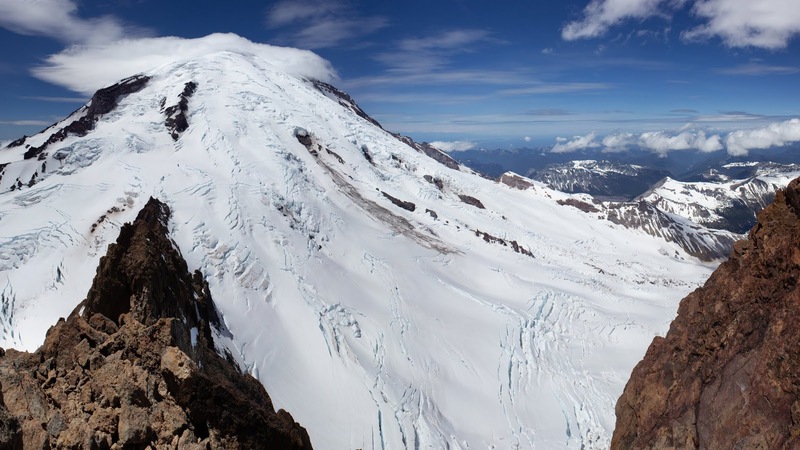 I was glad to be on Little Tahoma’s calm and sunny summit, ready to ski some corn. The ID and DC. 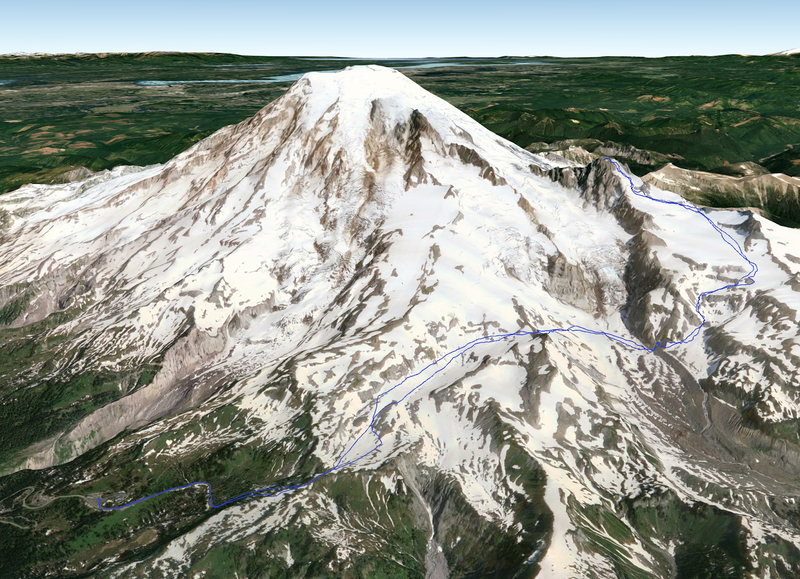 The ID still seems to be the favored route to the summit but there is a track on the DC. We gingerly downclimbed loose rock from the summit and continued back down to our skis. After being alone all day we met a couple parties who had come up from Fryingpan Creek. 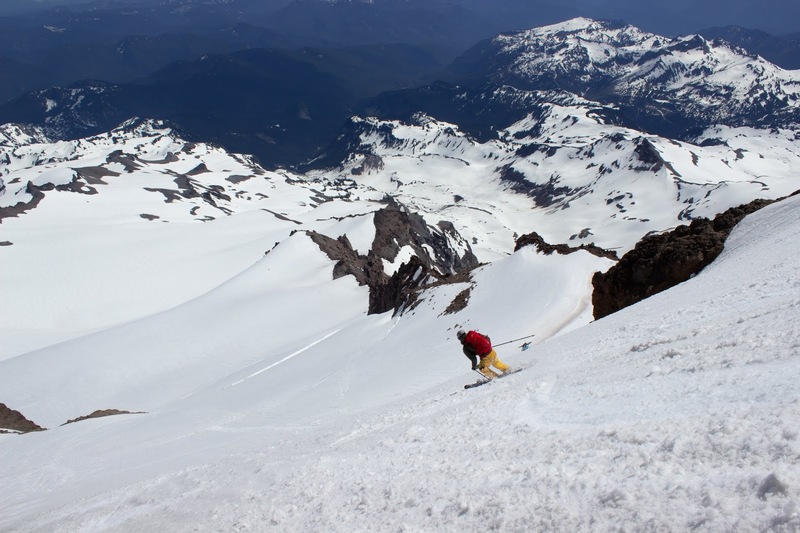 We skied a couple steep pitches of ripper corn down to the Whitman Glacier. 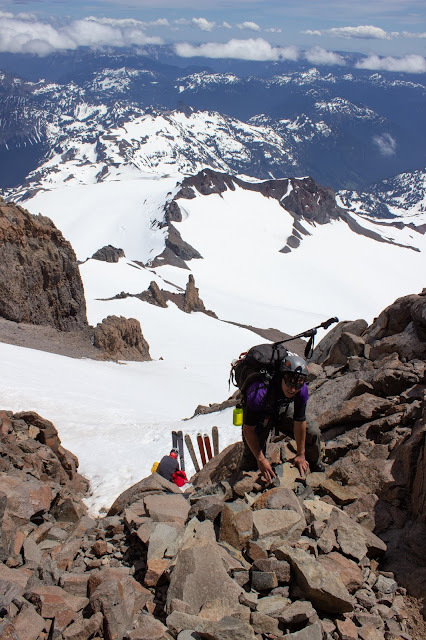 The snow got hot and sticky about halfway down the Whitman and was quite slow even on the steeper sections of the descent to the bottom of the Cowlitz and Ingraham Glaciers. 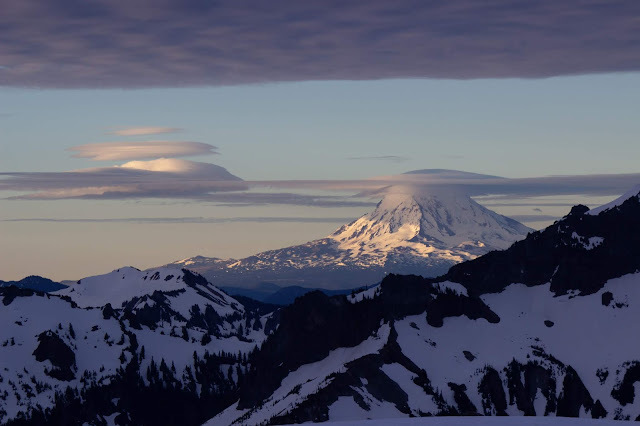 We slowly made our way back up to Cowlitz Rocks as clouds began to roll over. 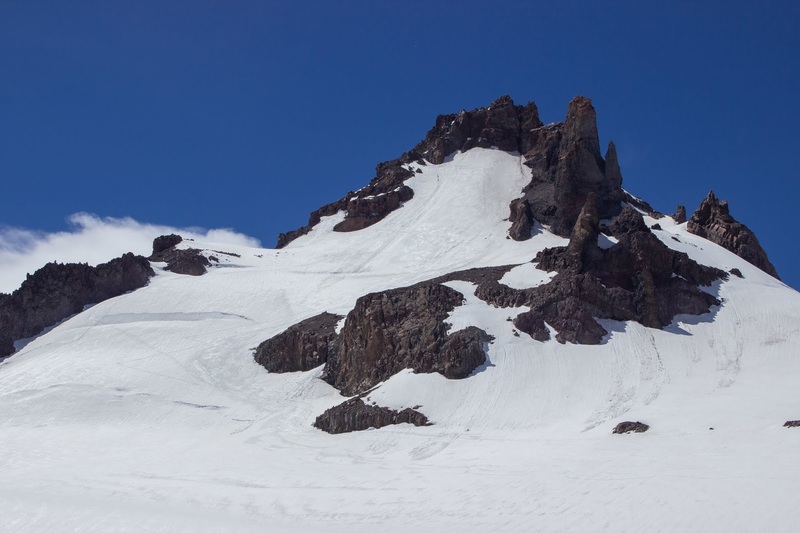 The descent from Cowlitz Rocks to Paradise is quite flat and involved a lot of skating because of the hot snow. We skied to Mazama Ridge and then down to the 4th Crossing and walked back up to Paradise. We made it back to the car at 5:20pm and spent a while watching the Paradise circus while eating chips and drinking the warm beer that we had forgotten to stash in the snow. Another great day on the mountain.